The Perfect Blend stamp set is one of those ones that I have stereotyped. I admit it. 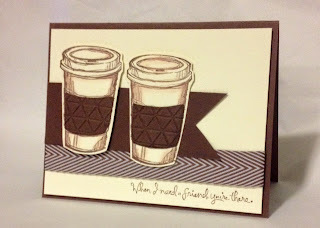 I'll need to look into alternate uses, because when I see a friendship sentiment I automatically think of Perfect Blend!! Today's card is no different, though, poor typecast coffee stamp! I saw the cute saying in the Choose Happiness set and thought how perfect it would be to go with Perfect Blend. And here we are again. My friendship coffee cups. I love getting coffee with friends, its just pretty near perfect in my book. 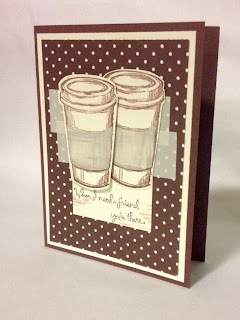 This first card, I just couldn't get over the optical effect the Chevron Chocolate Chip Ribbon creates in this layout. The base is Chocolate Chip, and it goes well with the Very Vanilla layer, but with the banner and the Tiny Triangles Embossing folder on the 'coffee sleeves', it makes my eyes go wonky. :-) 'Scuse me for being all technical. :-) See, It even made me do some weird placement on the coffee cups: more of a 'left behind after the meeting' feel, than the intended 'I am sitting with my BFF, and all is right in the world' feeling. So on the second card, I totally steered away from overpowering optical prints, ahhhnd then came right back again with this polka dot Background Designer Series Paper. 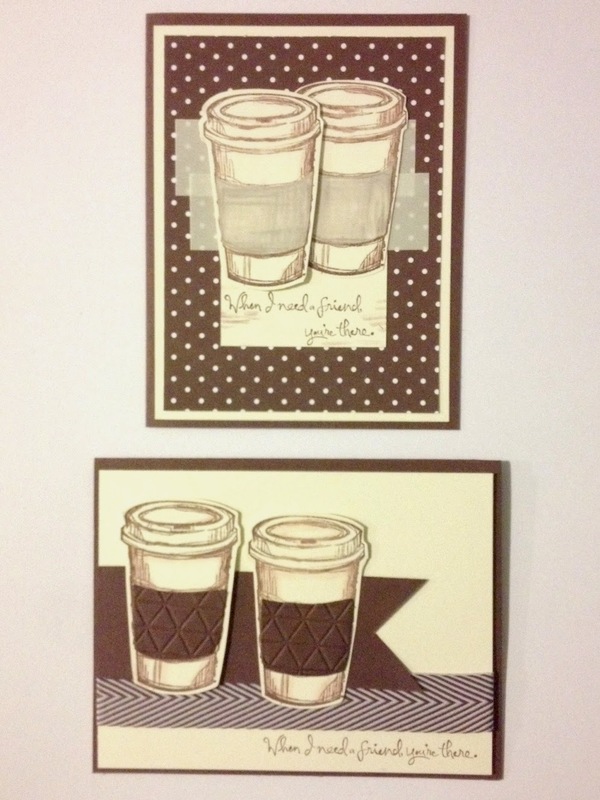 I did a better job I think of creating the focal point and the friendlier feel for the coffee cups. 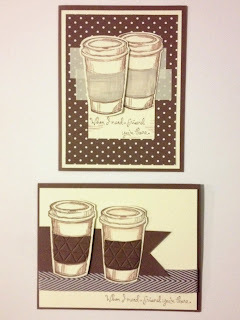 I used Vellum for the background strips, and cut them to size for the coffee sleeves. I used my blender pen and some Chocolate Chip and Crumb Cake inks to give the sleeves a little more definition, and then layered the vellum over the top. 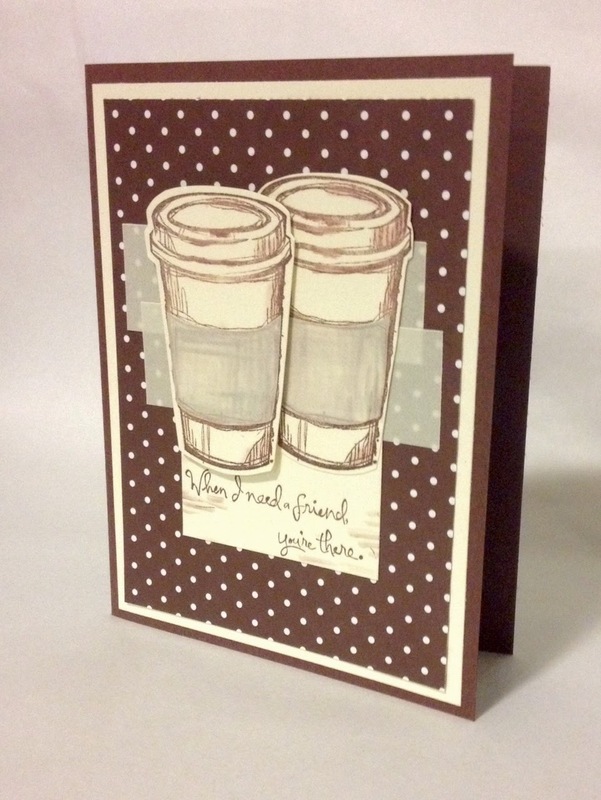 There is a Very Vanilla layer between the cups and the vellum strips, and I split the sentiment up a little to fit the scale of the card. Much happier with Version 2.0 today! Thanks for visiting! 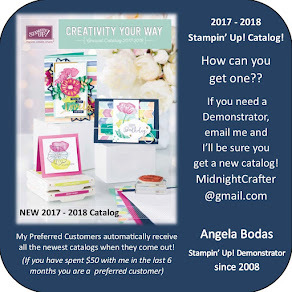 If you'd like to learn more about, or purchase, any of the Stampin' Up! supplies used today, I've listed them below. Click on the Image and you can view the info directly in my Online Store. Superior Quality, Secure Shopping, and Speedy Shipping directly to you! Crafty Gift Ideas?!? 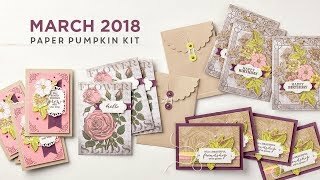 Paper Pumpkin is an awesome gift for friends, family - and yourself!! Find out about our Prepaid subscription gift giving ideas HERE.